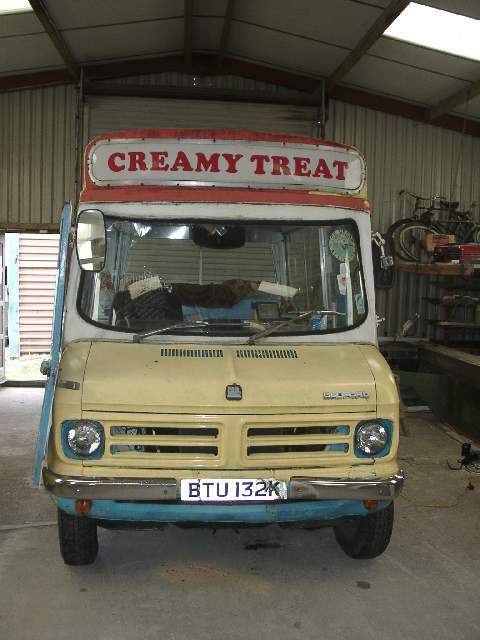 In October John and I traveled to England to ready the ICV for the journey – or at least start on getting it ready. I arrived about a week prior to John – spent the first day getting out to Somerset and getting organized in the Crewkerne area. The second day I was able to meet up with Caroline Clarke – she ended up being the lady that would rent us her barn for working on the ICV. Ended up spending a long afternoon cleaning the barn, reorganizing wood piles, moving cabinets, etc. to make room for the ICV. Here is the ICV in the Barn and ready for work. John and I had agreed that since I was going to be there about a week before he got there, the job would be to get the tools organized and demo the inside of the ICV – remove all the coolers/freezers and misc stuff that was inside it. A shot of the “business” side of the sink/softee machine I’ve started the demo of the sink area – you can see the Mr. Softee compressor on the left there and the sinks to the right. 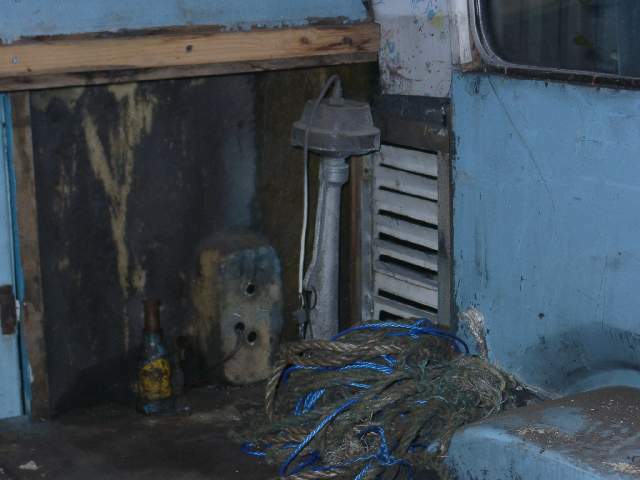 The thing below the sink is a water heater that is just kludged up to the heater hoses of the engine. 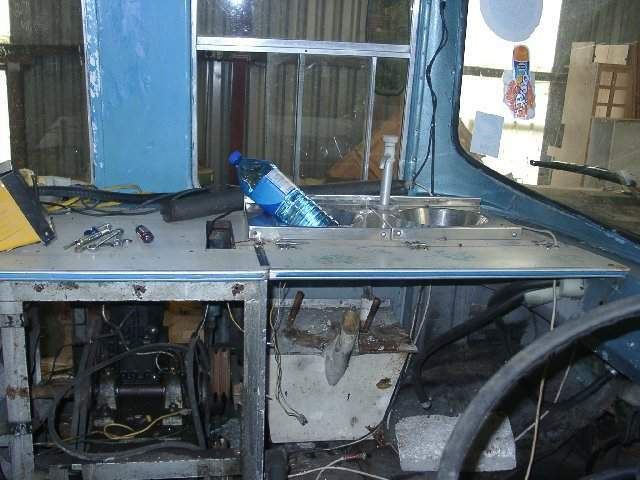 Ongoing demo work – the sinks are removed and I’ve stripped down the Mr. Softee compressor – (and removed the seat and steering wheel) – I had trouble figuring out how to get the compressor out of there because it was bolted down with hidden bolts and it weighed about 250 lbs. 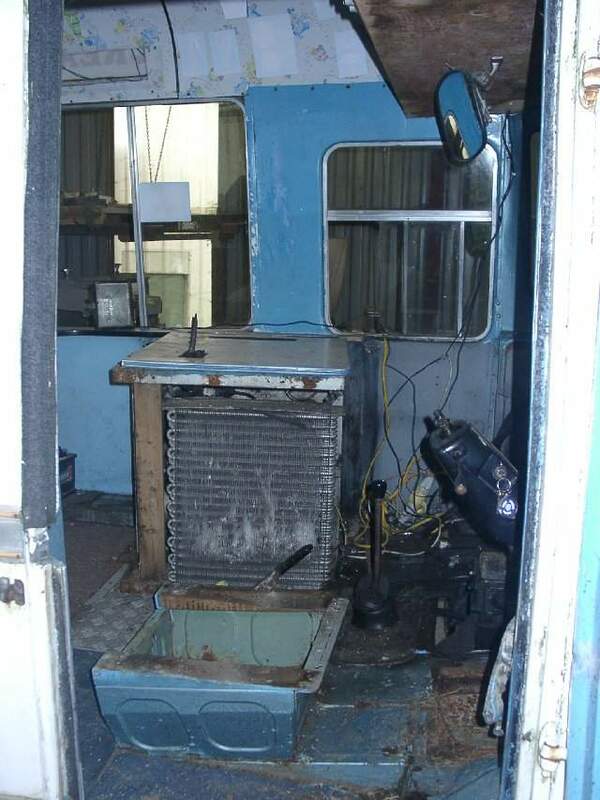 More demo work – this time the cooler/freezer behind the drivers seat. 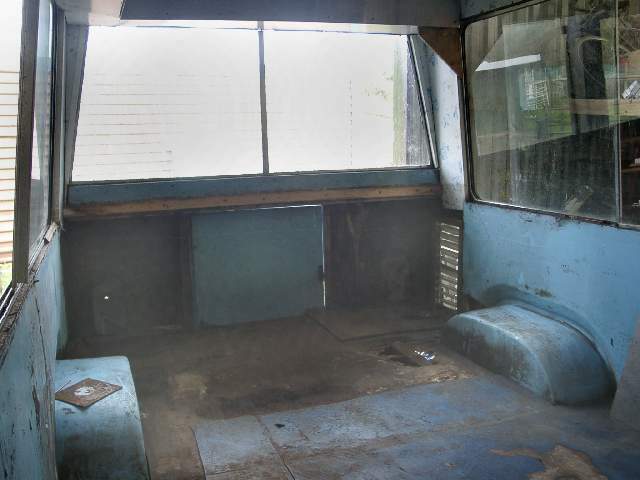 It was made of wood frame, formica exterior, and steel interior with foam insulation inside. 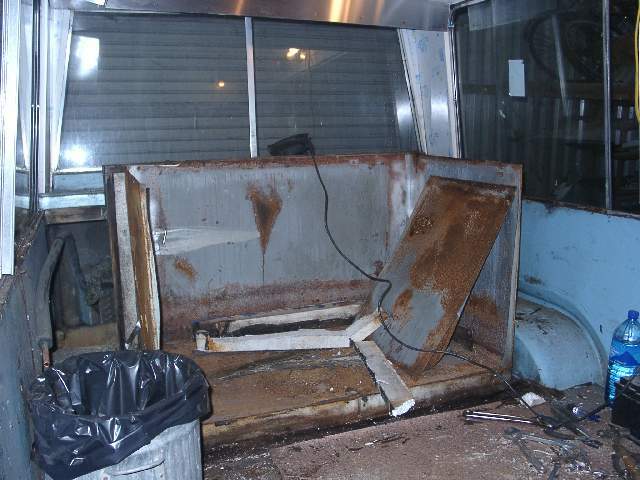 All the coolers were pretty disgusting inside because of rot, moisture, and left over ice cream from happier years. 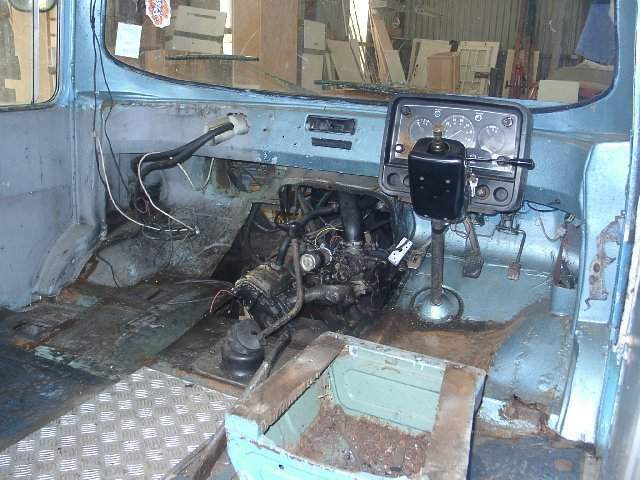 Demo completed in the front area – you can see the super deluxe dash board with all the essential gauges that you might ever need. 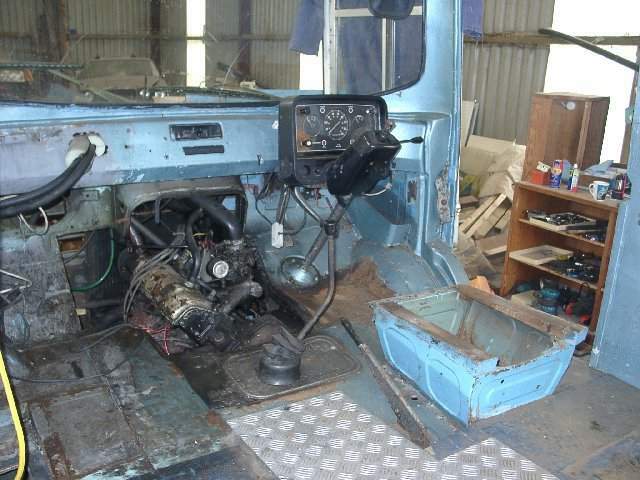 Also, the business side of the van – the 2.3 liter Vauxhall Slant 4 engine with the single barrel Weber carb. 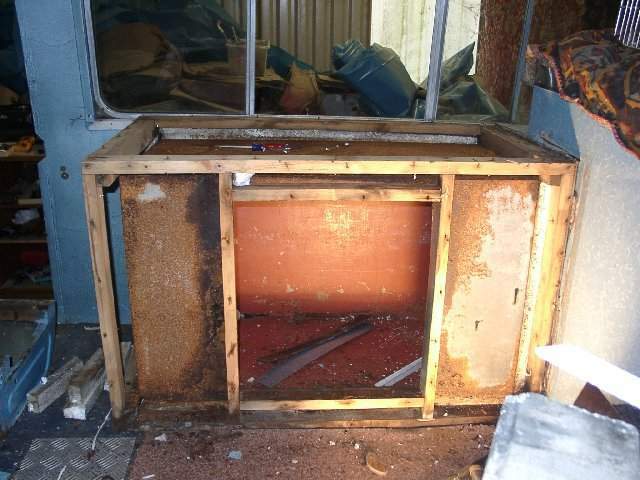 The rear freezer was so large (I think you could have easily fit 4 or 5 bodies inside of it) – that it could not come out in one piece thru the door. So, I cut it apart using a reciprocating saw. A messy job but fairly quick. A shot of the compressor for the freezers – this compressor was plugged into the house/garage at night to cool down the freezers over night. 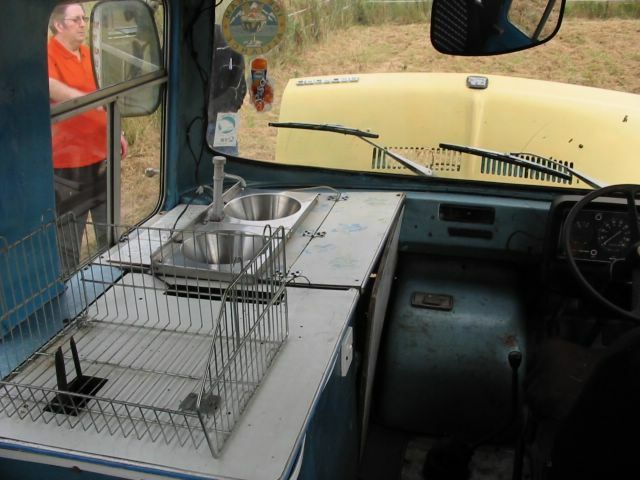 Then in the morning, it was unplugged and could keep the ice cream frozen for 8+ hours just with the insulation and the cooling plates inside the freezers. 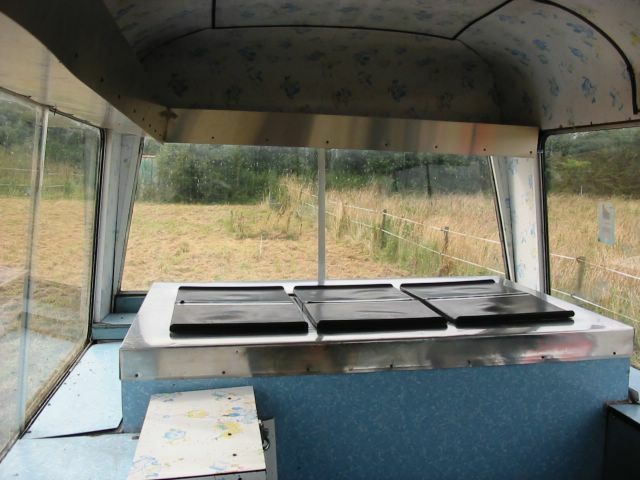 A shot of the loudspeaker for the jingles – it was placed in the very rear of the van and pointed down towards the road – you would think that maybe the driver got sick of listening to the jingles? Finally, the rear demo and most of the rest of it is done! 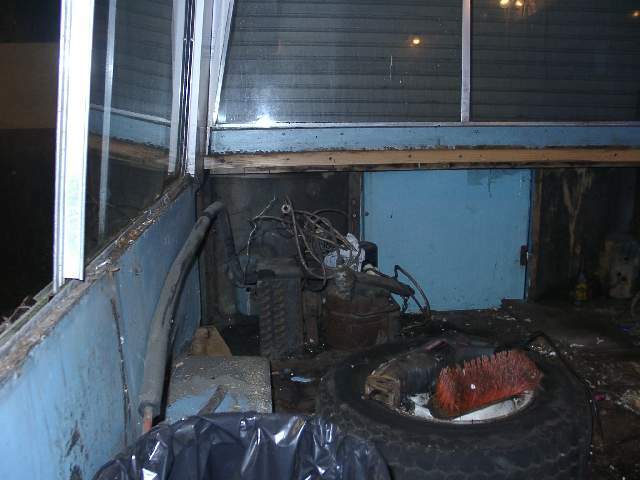 – Note the rotten wood flooring with holes straight through to the ground over the wheels.